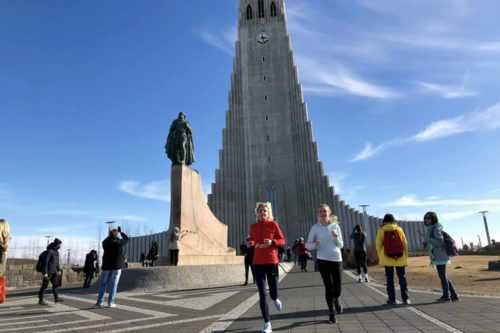 The perfect tour for runners who would like to experience the heart of the city center of Reykjavik including beautiful scenery and great running paths along the coastline. Established originally as a trading town Reykjavik has developed into the Icelandic centre of culture, commerce and government activities. Reykjavík is the world’s northernmost capital and among the cleanest, greenest, and safest cities in the world. It is harder to find fresher more crisp air on a running tour and where the history of Reykjavik meets us all through the run. Starting at Reykjavik´s Vesturbaejarlaug a small and friendly neighborhood geothermal heated pool, located within walking distance of the city centre. Swimming pools are an essential aspect of Icelandic culture. The hot tubs are also one of Iceland’s most important social venues where people meet to openly discuss everything from the weather to politics and in the evenings to watch the Northern lights dancing among the stars. This route is on a beautiful path along the sea to Nautholsvik geothermal beach (opened in 2001 and using run-off water from the hot water tanks atop Öskjuhlíð the lagoon is warmed up to a comfortable 15-19°C during summer opening hours). We will pass the Öskjuhlid woodland (with great trail paths) surrounding the Pearl glass dome on the top of a hill in the center of Reykjavík, with a 360 degree observation deck. Views here are stunning and worth a stop for a photo and orientation. On our way to the heart of the city and the main landmarks of downtown Reykjavík, we will see Tjörnin pond with its bird life and surrounding gardens and then take a little uphill climb towards Hallgrímskirkja – largest and tallest church in Iceland. Then the running tour continues along the sea towards Harpa concert-and conference hall with stunning views of the ocean and Mt. Esja. On our way back you’ll run past fishing trawlers, whale-watching boats, restaurants and small shops in the old harbor area. Since this is a private tour, you will define the pace and have plenty of time to take pictures, if you wish. Pick-up service: We meet you at your hotel/apartment address in Reykjavik , depending on the tour route. Please enquire at booking stage. Alternatively, please, meet at the standard meeting point. Standard meeting point: Vesturbaejarlaug, outside the entrance of Vesturbaejarlaug (Vesturbaejar swimmingpool). Located within walking distance of the city centre. Outdoor geothermal swimming pools, including one for kids, plus a steam room, sauna & hot tubs. We are meeting right in front of the swimming pool. You can get there with bus 11, 13 and 15 or just walk from downtown.